These Chicken Salad Curry Wraps are everything you love in an Indian or Thai dish wrapped up in a tortilla. Perfect for summer lunches or picnics! Mix together all the dressing ingredients in a large bowl. Then gently fold in the chicken, cucumber, carrots, cashews, and raisins. Chill in the refrigerator for about an hour. 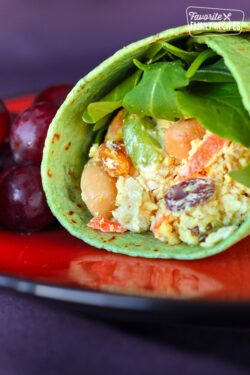 Spoon the chicken salad into your wrap (ours made 6 to 8 wraps), top with lettuce, and roll up.